Mackerel fishing trips are a great outdoor activity to try during your holiday in Weymouth. Head out to sea on a state of the art charter fishing boat and use a rod and line to try and catch yourself some mackerel. The trips are two hours in length and we head out into Weymouth Bay. 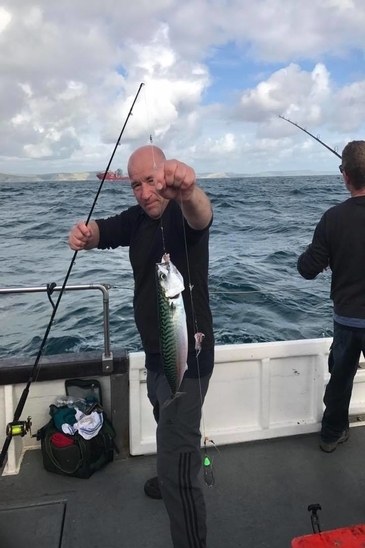 It's no problem if you've never fished before or don't have any of your own fishing gear, we will supply everything you need to feather for mackerel. Any mackerel that you catch can be taken home to enjoy fresh on the barbecue. Mackerel trips are great for children and are the perfect introduction to spending time at sea. Rods, reels, bait and tackle are provided. £20 pp per trip. If you would like any further information about half day trips or would like to book for an individual, family or a group, please contact us.